Great glories of chanting Mahamantra – கலியையும் பலி கொள்ளும் (yes, it wins over even the bad Kali times)! The mahamantra has 16 words. This Kirtan has 16 stanzas, and each stanza seems to glorify the words in the Mahamantra! 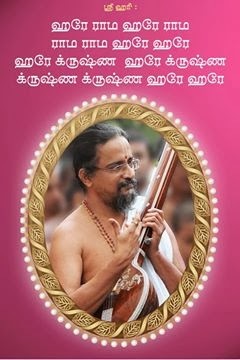 The Kirtan in Tamil, its transliteration in English and explanation in English are presented here. The Kirtan is set in the same melodious Raga as the Mahamantra Kirtan sung by Sri Sri Swamiji. SEE BELOW: Kirtan on Mahamantra benefits in Tamil, English and verses meaning in english! 1. Oh, ye! sing! Oh, ye! sing! The HYMN! which, sans any discipline/regulation strikes down even the Kali! 3. Oh, ye, sing! Oh, ye, sing! The HYMN which in a moment fulfills worldly and heavenly aspirations! 6. Oh, ye, sing! Oh, ye, sing! The HYMN! Which though showered freely around, is certainly a gem, an invaluable gem! 7. Oh, ye, sing! Oh, yee, sing! The HYMN! Which has found a way of liberation for people of the world alleviating misery! 8. Oh, ye, sing! Oh, ye, sing! The HYMN! Which houses [with]in “IT’ Yoga, Yaaga, holy rivers and deities! 9. Oh, ye, sing! Oh, ye, sing! The HYMN! Which shines in cosmic space, and bestows Yoga siddhi! 10. Oh, ye, sing! Oh, ye, sing! The HYMN! Which purifies the devotee who sings and the place where sung! 11. Oh, ye, sing! Oh, ye, sing! The HYMN! Which bestows the highest state on all – birds, animals, grass and plants! 12. Oh, ye, sing! Oh, ye, sing! The HYMN! Which shows Devas [to you] and makes God speak [to you], and revered by the world! 13. Oh, ye, sing! Oh, ye, sing! The HYMN! to fulfil the vow of the One who swore to make it known to the world! 14. Oh, ye, sing! Oh, ye, sing! The HYMN! vital like the water! food may vary but not water! 15. Oh, ye, sing! Oh, ye, sing! The HYMN! Which as is changes destiny! 16. Oh, Ye, sing! Oh, Ye, sing! The HYMN which Chaitanya Mahaprabhu and Nityananda flooded with devotion!